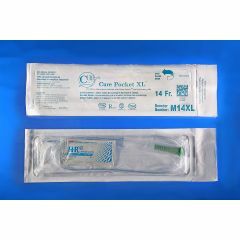 Cure Medical Extra Long Intermittent Catheter with Lube - 14Fr. 25"
No More Need For Extension Tubing! The Cure Medical Extra Long Intermittent Catheter is a high quality DEHP and latex free product that always has fire polished eyelets that are smooth and less irritating. The U Shaped packaging enables men to discretely carry the product in a pants pocket.